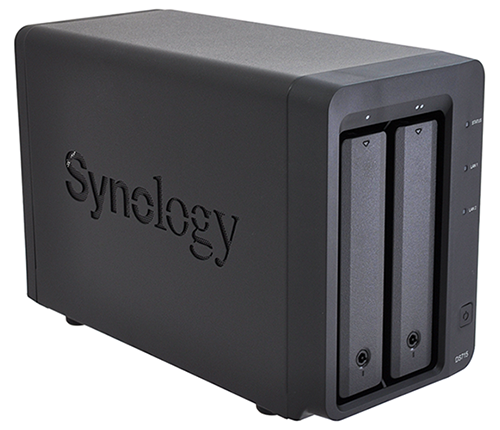 Synology has established itself as the go-to name in the world of network-attached storage. The firm's varied portfolio covers everything from home or small-office storage to large-scale business deployment, and having tackled almost every conceivable usage scenario, now faces the enviable task of plugging any remaining holes. Priced at around £330, the DS715 is aimed at small-business workgroups and sets itself apart from most other Synology solutions in this segment through the option of expandability. Allied to a five-bay DX513 expansion unit, the DS715 can potentially take advantage of seven-bays, allowing for up to 56TB of raw capacity when 8TB hard disks are employed. 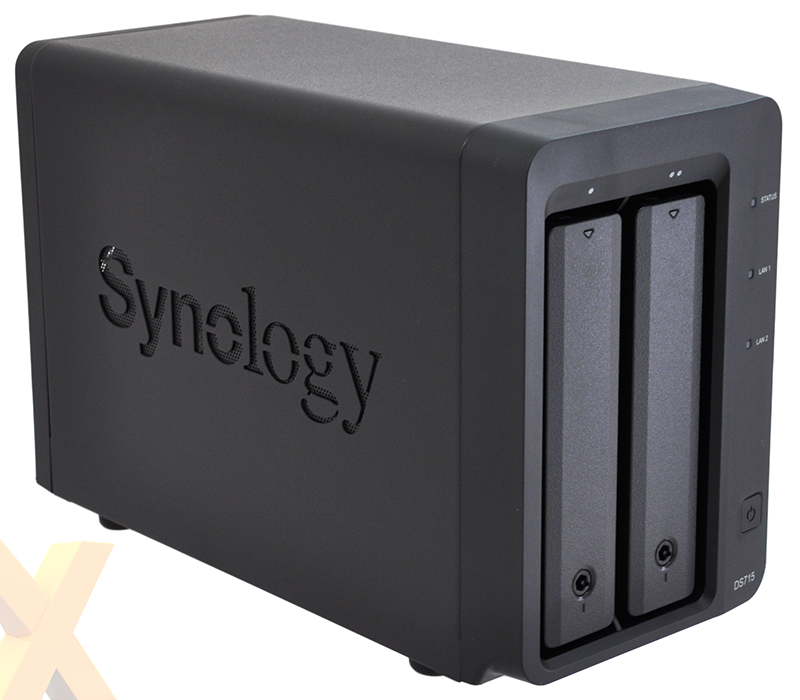 Handy if you're dealing with massive amounts of data, but you may be wondering how the DS715 compares to similar units so now's a good time for a refresher on Synology model numbers. In a nutshell, the first two letters designate a desktop or rack-mount form factor, the first number(s) identifies the maximum number of bays supported, the next number is the year of release and any remaining suffix is used to differentiate between performance class. Examples of the latter include the lower-end j series and the higher-end + models. The DS715, then, is a desktop unit supporting up to seven bays (two built-in, a further five via the optional expansion unit) and is a standard 2015 model. 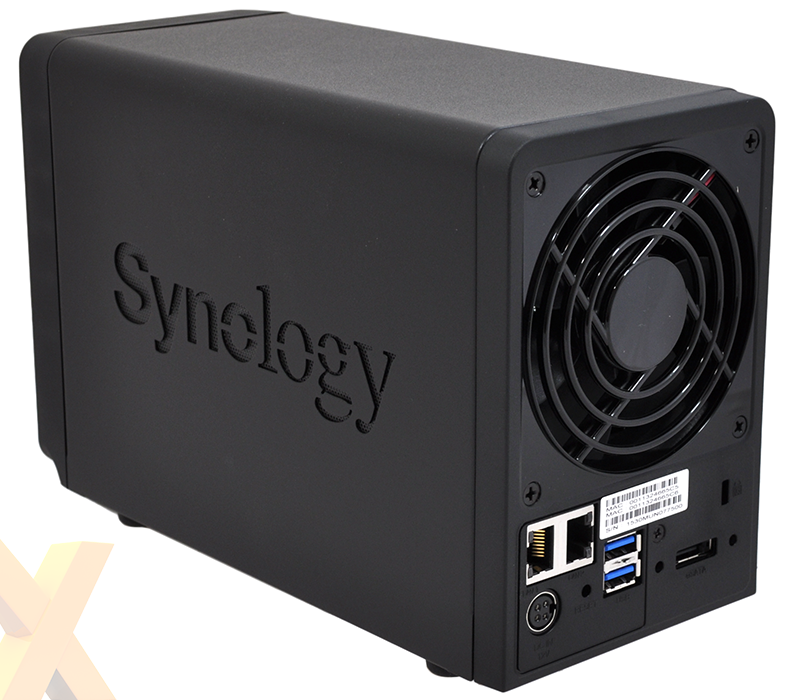 Synology's dual-bay design looks and feels familiar - the 157mm x 104mm x 232mm chassis is essentially the same as the DS215+ - and build quality is good throughout, with the spring-loaded and lockable drive trays working well. Keeping the enclosure relatively simple, the front is home to a solitary power button and three LED indicators - LAN 1, LAN 2 and Status. All the I/O action takes place around back, where the DS715 provides dual Gigabit Ethernet ports (with support for failover or aggregation), two USB 3.0 ports, eSATA, a Kensington lock and a connector for the external 72W power supply. A single 92mm fan is tasked with keeping the unit cool and it does so while making barely any noise. What's handy is that the fan can be removed for cleaning by undoing four simple screws; however the tight fit suggests that it can't easily be replaced by an alternative fan of your choice. Another area in which the DS715 differentiates itself from similar Synology units is the internal hardware configuration. Unlike the DS215+ and DS713+, both of which are dual-core, the DS715 follows in the footsteps of the DS1515 by utilising a quad-core chip from little-known Israeli chip manufacturer, Annapurna Labs. The 1.4GHz processor, dubbed the Alpine AL-314, touts a hardware encryption engine as well as a floating-point unit, and is partnered by 2GB of DDR3 memory. A cost-effective combination, and our experiences of the DS1515 suggest that performance should be decent. There is a catch for users eyeing up the DS715 as a media server, though, as the AL-314's ARM Neon-based media processing engine isn't currently supported by Plex. That's something to bear in mind for media-centric users and worth knowing about if you've been awaiting a direct successor to the Intel Atom-based DS713+, as the DS715 is more of a sideways step. Both models are similarly priced at retail, and we suspect Synology may need to revise the DS715's RRP if the unit is to stand out as a more affordable alternative to the Intel-based DS713+. A key reason for Synology's success in the NAS space is the polish and versatility of its DiskStation Manager (DSM) software. 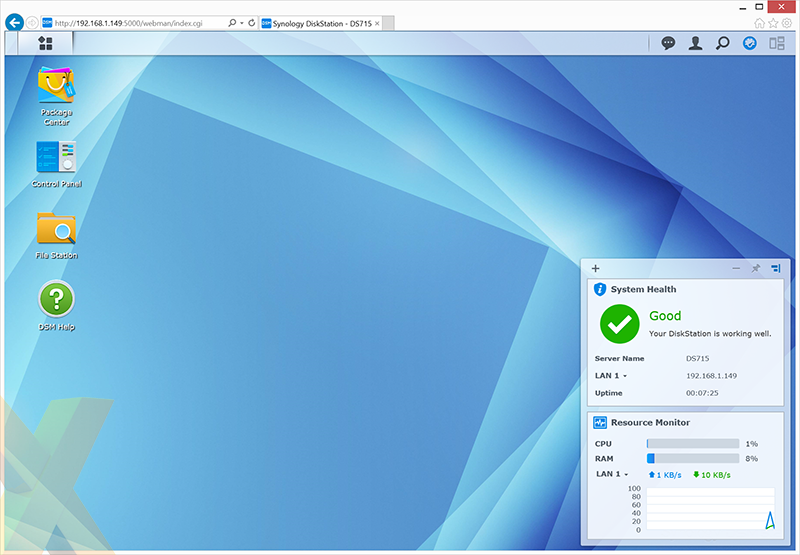 Regularly updated and currently at version 5.2, DSM can be experienced using Synology's live online demo and there's a wealth of functionality to explore. Easy to configure and intuitive to use, DSM is one of the best NAS operating systems available and it scales particularly well, serving the single home user as competently as busy office environments. 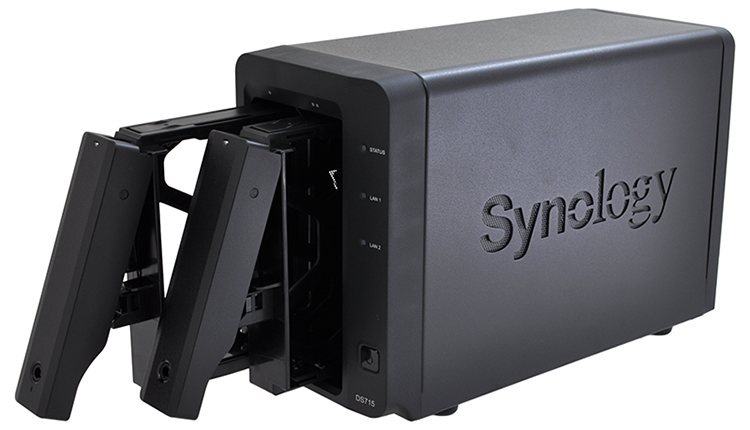 The latter is where the DS715 is better suited and businesses can take advantage of comprehensive backup solutions for local, network or cloud, support for iSCSI targets, Windows ACL integration and a Central Management System for users with more than one Synology NAS.